The Divine Feminine Isn't Returning…. She has been here all along. I am taking a stand for Her. For us. For our earth. We are a people in great need of remothering. We have to start somewhere. The return has been in process for a very long long long time.The energy quickens as world affairs continue to baffle us.From the burning of churches in the US as a direct attack on the black community, to the organized taxi strike violence in Paris, to the beheading of women accused of witchcraft in Syria, things are happening that haven’t happened before. We can say, it it has always been this way. But, has it? What are we to do? What can we do? I don’t know what is right for you to do. I only know what is right for me to do, which is to bring our attention to the inclusion of the feminine in our lives. From the Divine Feminine with all capitals, right to gender inequality – we are being impacted intensely. Recently hearing Jimmie Carter speak, at 90 years old, after a lifetime of doing good work in the world say that one of the most pressing issues to which he is dedicating his life is gender inequality regarding women and girls – he believes it is affecting every single part of our lives and our earth. He said, the men in power ‘just don’t give a damn’ and he even left his own church of over years due to their position on women. He is taking a stand. I am taking a stand.I know we have begin with our own hearts, asking ourselves questions about our relationship to earth, to self, to spirit, to the feminine. And see where that leads us. This letter is an invitation, from my heart, to yours. For those of you who have been including me in your prayers as I work through a healing crisis, thank you very much. I continue to work on it (lower back stuff) And I am concerned with the world.At the same time that I am working on being conscious, and working on behalf of transformation, I am enjoying my time with my beloved Jonathan and friends, resting and getting ready – about to move into a week of teaching painting in Italy. The balancing act is more like juggling. 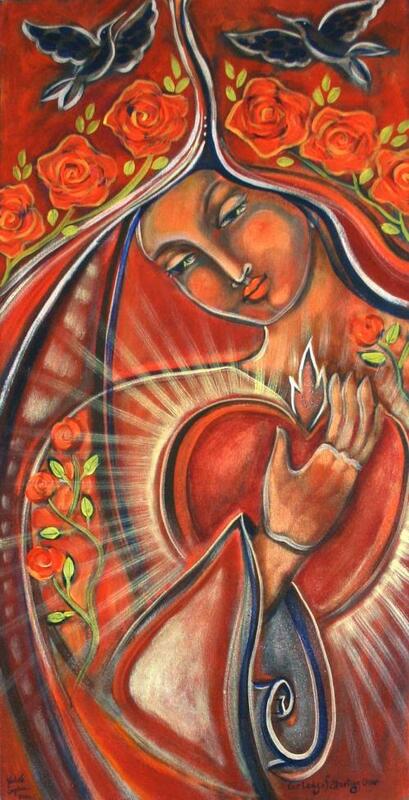 I wrote about this a few weeks ago in my article, How Do We Stay Conscious While Being Aware of the Suffering in the World.I created this video for the Red Madonna sisterhood before I left for my trip – it was for this full moon in July. When I watched it again, I realized I felt brave enough to share it with you too. I am sure, like anything of truth or the feminine there will be some backlash, that’s ok. She, we, can take it. So I bravely share this with you – an invitation to return to HER in your own way. I would love to hear your response – both the parts that challenged you or blessed you or inspired you to just think differently than you are about it. The table is set with many cups of tea at the red thread cafe, perhaps one of them is yours and it is your time to enter the conversation. Sending love from Venice. Happy Full Moon illumination blessings to you. ← Lineage of Water and Fire – My journey so far….